One month from today, the Portland Pilots open up the 2013-14 season against UC Davis. The Aggies are tough to get a read on. Their top returning player is Corey Hawkins, a junior who's been named to several preseason All-American teams already (and they're starting to talk NBA chances over on the Aggie forum). Also back is another guard, Ryan Sypkens (14.1 ppg, 46% from 3) - and a 6'9" perimeter guy in Josh Ritchart. But beyond Hawkins, Sypkens, and Ritchart...anyone's guess, really. Tyler Les (son of Jim Les) is now expected to redshirt for the season given the glut of guards on this team - former USF guard Avery Johnson is on the team this year as well. They played a three-guard system last year and with the season-ending injury to their pretty good PF J.T. Adenrele back in August, it's pretty much guaranteed they'll do the same. Heck, they're so thin down low that you might see them with four guards on the floor at any given time. Two things are certain about the UC Davis game...van der Mars, Barker, Nicholas, and Gerun will give the deep Pilots front court a big advantage down low, and whoever draws the task of guarding Hawkins will have their hands full. 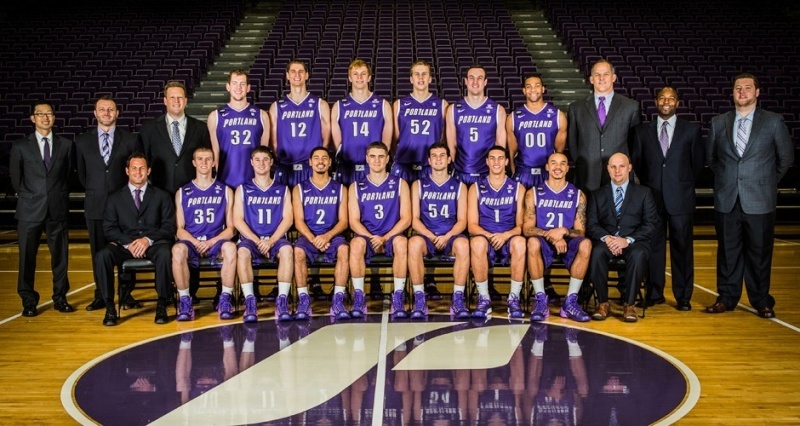 DeanMurdoch wrote: One month from today, the Portland Pilots open up the 2013-14 season against UC Davis. Still too early for me to wrap my head around your very good scouting report, DM.....but watching the Pilots practice, it appears that UP's game will be to pound it inside with kick-outs to the wings.....not nearly as guard oriented Cal-Davis or many of the Pilots' opponents. Thanks, wrv. I have no argument whatsoever with the predictions in the article. It is my HOPE that UP can finish at least 6th in WCC play and avoid the first round in Las Vegas in March. Re: Bill Grier as WCC Coach of the Year.....yea, if Rev doesn't get it, I would really like to see Coach Grier earn the honor. A terrific guy, he's faced some very trying times (not of his making) at USD. Not sure I would have called Jake Ehlers "insignificant," but I'm sure the author was just looking at numbers. I hope he is right and that there is good reason for suggesting that we keep an eye out for Bobby Sharp . . . They don't see it coming. up7587 wrote: They don't see it coming. And I didn't see the word "compendium" coming. Well played, wrv. Anyone have ESPN Insider? Wouldn't mind seeing who they have as the Pilots' projected starters...or even if they've considered the newcomers that a lot on this board think will have an immediate impact. They pick UP to finish 10th, for the record. Tenth is a harsh assessment, but as stated above, "they don't see it coming." ESPN projects Thielke as a starter--though there is discussion of the options at guard, I think a more informed preview would have Wintering at pg . . .
C Thomas van der Mars, Jr.
"It's hard to imagine Portland making significant noise this year with Nicholas and van der Mars being the only certain net positives for the Pilots. Bailey will have to become a more polished offensive threat, and Reveno will have to find the right guard lineup. If meshing does happen, Portland can reach reach double-digit victories, but a .500 finish in West Coast Conference play is probably unrealistic." wrv wrote: Tenth is a harsh assessment, but as stated above, "they don't see it coming." ESPN projects Thielke as a starter--though there is discussion of the options at guard, I think a more informed preview would have Wintering at pg . . . Yes, absolutely...Alec is our PG for now and the future. Maybe I'm just an optimist, but I'm picking the Pilots for 6th....barring injuries!! ESPN wrote: If meshing does happen, Portland can reach reach double-digit victories, but a .500 finish in West Coast Conference play is probably unrealistic." Bulletin board fodder for the team. The past couple of seasons have been rough on The Bluff. Brutal schedules, lack of point guard play and general ineptitude on offense have combined to keep the Pilots in the conference cellar. Obviously, Nicholas has no control over the schedule and, being a forward, has nothing to do with the lack of point guard play. But, that offensive ineptitude comment doesn't apply to him either. Far and away the best player on the team the past two seasons, Nicholas has drawn all the attention on defense. Despite that, he's posted offensive ratings over 100 and crashed the boards like a mad man. Last year he logged eight double-doubles, this year he might average a double-double. He should also make his first appearance on the all-conference team. Nothing to substantiate this, but Coach Reveno's tweet from just before practice this morning sounds alarmingly like what you'd expect to hear from a coach who had just parted ways with a player... Or retracted a scholarship offer... I hope we don't see any surprise roster changes in the pre-season again this year (as with Cason leaving the team last year). You can win games with players that don't fit core values but you won't win a championship. Need to make tough decisions and be disciplined. I'd been guessing all along they were headed down the Eugene....but the Lorenzo Romar connection makes a lot of sense as he's been a long time supporter of Coach Reveno and his staff. Fans and media are not allowed to attend these sessions, and we're not even supposed to know about them.....or at least the institution is not supposed to tell us about them...but it was on ESPN Insider too. As we prepare to enter the season, what do we all think we need to accomplish this season to call it a success? Or, not a failure? What will it take to save Rev's job? NoPoNeighbor wrote: Nothing to substantiate this, but Coach Reveno's tweet from just before practice this morning sounds alarmingly like what you'd expect to hear from a coach who had just parted ways with a player... Or retracted a scholarship offer... I hope we don't see any surprise roster changes in the pre-season again this year (as with Cason leaving the team last year). Given that we have no update on the tweet from Reveno, is this possibly an oblique reference to our long lost Lat, whom I suspect is not coming back next year. In response to what Reveno needs to do, I think win more than last year notwithstanding the stack against him doing so. wrv wrote: Given that we have no update on the tweet from Reveno, is this possibly an oblique reference to our long lost Lat, whom I suspect is not coming back next year. Or maybe nothing more than general philosophical ramblings about no person in particular, which is what I got out of it. A friend of a friend that works at Nike, says the game between UW and UP will be at the Nike Center in Beaverton......no one is invited!! The Pilots open the season ranked #191 out of 351 D1 teams. Pomeroy projects a 13-17 overall record and a ninth-place finish in the WCC with a 6-12 conference record. Interestingly enough, Pomeroy thinks the Pilots could have an 8-2 record at one point during non-conference schedule - projected win against UC Davis to open the year is followed by projected road losses to Oregon State and Michigan State, but the next seven games are all projected wins (Idaho, Columbia, North Texas, SJST, Southern Utah, PSU, and Montana State). I was at the Calaveras frog jumping contest a couple of years and noticed a lot of muscled square jawed critters. One was getting what it's owner said was a sugar suplement under his toungue. I had a nice time on the proceeds from the bet I put down on Barry Bounds. DeanMurdoch wrote: The new Pomeroys are out! And the WCC is the 10th ranked conference....just behind the Mountain West...out of 32 conferences and the independents. UP's non conference opponents include #2 Michigan St; #73 Oregon St.; #124 Princeton; and #134 Bradley. The rest of the teams on UP's non-conference list are currently rated lower than UP. But really, it's all just a guess at this point……and it will be only an educated guess after the first month of the new season. F Ryan Nicholas (Portland): An honorable mention All-WCC selection (last year), Nicholas (13.0 ppg, 8.7 rpg) will be asked to lead the way for the Pilots. After three straight seasons of 19 or more wins the Pilots have hit a rough patch, winning a total of 18 games over the last two seasons. But now the Pilots have some experience, with Ryan Nicholas and Kevin Bailey leading the way. And with underclassmen Alec Wintering and Bryce Pressley doing a solid job of running the show during their summer trip to Europe, Portland may be better equipped to deal with some of the better backcourts in the WCC. If this proves to be the case, Portland will be fine. 7. Portland: The Pilots have one of the better front court players in the WCC in senior Ryan Nicholas. If guard Kevin Bailey can continue to make progress (11.4 ppg last season) Portland is capable of finishing higher.